Maria Lucas, who worked in our office for a year before moving permanently to Chile, has just come back from her first ever visit to Patagonia. Located where the Andes slowly sink into the sea, Chilean Patagonia is characterized by numerous mountains, glaciers, fjords and channels that stimulate the adventurous traveller ‘s instincts. Gateway to the Torres del Paine National – this is also a charming Chilean port. The recent opening of Puerto Natales airport during high season means that direct flights save a 3 hour drive from Punta Arenas. This territory was once inhabited by the Kawéskar and Aonikenk peoples is world-renowned for its great beauty. I entered the territories between mountains, glaciers, lagoons, rivers and forests. I walked, cycled and rode; got to know estancias – local ranches- immersed in immense prairies. It was without a doubt, the Patagonian adventure that I imagined. Near the town, we also find the Milodon Cave Natural Monument, former home of a 3 meters tall herbivorous mammal whose remains can be found in the British Museum. In Puerto Natales we find a great diversity of hotels to stay in, depending on what you are looking for. 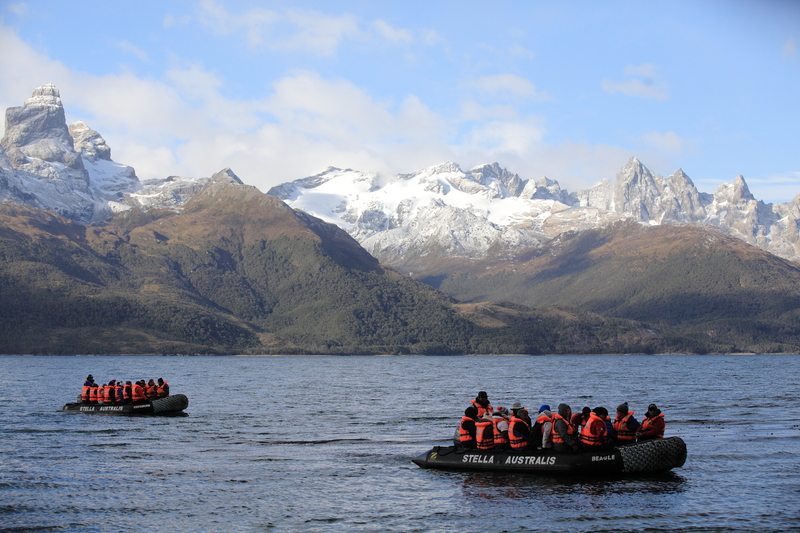 Among them, I must highlight the Remota Patagonia Lodge with its vast views of Fiordo Ultima Esperanza -Last Hope fjord. An award winning hotel for its sustainable architecture that offers warm and personalized services and excursions inside and outside the park. The trails surrounding the Milodon Cave offer numerous options for trek lovers and also mountain bikers. There is a series of trails and a varied range of panoramic views of one of the most interesting areas of the Chilean Patagonia, The Paine mountain range. The main path leads to the largest of the three caves, where the remains of the Milodon were found; a full size replica can be found on site. Most visitors, only do this short walk. However, we went further and the fabulous views were well worth the effort. To stand at the viewpoint contemplating the immensity of the Chilean mountains and landsapes is among all the feeling of being in Patagonia. The Chilean Patagonia estancias are slowly opening up to tourism. A visit gives you the opportunity to experience the lifestyle at the tip of the continent. Any visit will offer horse riding, hiking, cultural experiences related to the work of Gauchos with dogs and horses and sheep shearing. The traditional “cordero al palo” barbecue – roasted whole lamb will be essential. A full day experience in an estancia is without a doubt an unmissable Patagonian adventure. For me, the Estancia La Peninsula is definitely a recommended place. A cosy estancia in a peninsula where the attention of the staff makes you feel at home. To get to this estancia we navigated the fjord Ultima Esperanza. On arrival, we had an exciting horse ride through a spectacular setting of Lengas and Coigües; returning by a path on the shore of the fjord. In the estancia, we tasted the famous roasted lamb that had been roasting slowly for over 3 hours. A good glass of Chilean wine, or a southern beer accompanying that tender meat in the typical landscape of the place, was a fitting Patagonian lunch. Before leaving the place we witnessed the traditional shearing. Five kilos of wool were shorn off a single sheep in around 3 minutes. We also got to learn shearing functionality and the different types of wool quality. To get to the Gray Glacier, the boat trip is a very recommendable way to arrive. This is on an ice boat which will take you close to the glacier`s walls. zodiac heading for Islatak Island. From there, you walk on this one for about an hour to reach the glacier. This is a walk that requires being in good physical condition and suitable clothing. Upon reaching the ice, the guide helps to adjust the ice equipment – ice axe, crampons, helmet and harness. Fabulous. If you wish to full fill your Patagonian dream , contact us. It was a FABULOUS trip – so THANK YOU! All the bookings, guides and transport that ANDEAN set up worked out very well for us and made for a great trip. For me the highlights of the trip were seeing the incredible landscapes of Patagonia, Perito Moreno glacier, the beautiful hikes to Lago del Torre and Fitzroy in Los Glacieres, and completing the Torres del Paine W trek with highpoints of Frances Valley and the Torres. The W-trek was a little harder than we anticipated mostly due to weather which we had heard about but was truly unlike anything I’ve experienced (50-90km/hr winds)! But the trek was a good challenge and we were proud to have completed it! Everything you set up worked out very well for us – having 2 nights at Refugio Chileno was super as that gave us more options to get up to the Torres which we saw very well in between snow showers. I would not have wanted to walk up to the Torres on the same day as getting to another hut. We also had a great time at Perito Moreno and at El Chalten where we did two 25km hikes and got great views of the Fitzroy range. I’m glad to have done all that before the TdP – would not want to have missed that! I really liked the town of El Chalten and the hikes there were a bit easier and absolutely beautiful. After TdP,  we rested in style on the MV Stella Australis (having gotten upgraded to a first class cabin!) on our voyage through Tierra del Fuego and the Beagle Channel to Ushuaia. This was truly a life-changing wonderful trip! We had a great holiday, thank you! I think our favourite day was when we did our trek up to the base of the towers in Torres del Paine - great views. The Chilean tour company were very good, everything went smoothly. Their drivers tended to turn up 10 minutes early. Thank you again for our great trip.